PEER report, for most of you this still means 'traditional' publishing in a subscription journal, as the audience and impact of established journals are what researchers are looking for above all else. But we've learned that many authors like the idea of having their article available as Open Access. Some authors even take a journal's access status into account when deciding where to publish. So what are the options Elsevier offers authors who want to make their articles open access? Read on and find out! First off, there are the outright Open Access journals, free and available online to all. Hosted on our ScienceDirect platform, these journals can be downloaded by anyone with an internet connection. Since they are free of subscription charges, publishing in an Open Access journal does involve a processing fee for you as author (or your funding institution) to finance the cost of publication. This covers managing the peer review process, supporting our publishing and hosting platforms, typesetting, marketing and other publishing costs. Our processing fees are reviewed regularly to ensure that they are reasonable and competitive. This is the hybrid option; you publish in an established subscription journal, but whereas other content is for subscribers only, your article is available to all (just like in an Open Access journal). Effectively, you sponsor access to your article, published in a well-established journal. Again, a processing fee applies, as Elsevier has a 'no double dipping' policy: we don't charge our subscribers for articles they could also get from Elsevier for free. Many of our authors are able to use their grants to cover these fees. In particular, Elsevier has established agreements with funding bodies including the Wellcome Trust and the Howard Hughes Medical Institute to reimburse authors for their open access publishing costs. In recent years, sponsored Open Access articles have been published in such journals as The American Journal of Human Genetics, Neuron, Cell, and the European Journal of Operational Research. A total of 1,160 Elsevier journals now offer authors the option to sponsor open access to their articles. 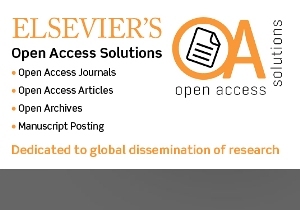 The archives of over 30 Elsevier journals offer free public access to published articles. How long it takes for any one edition of a journal to enter the open archive varies per journal. For example, all Cell Press articles are freely available after 12 months. You can find more information on journals with open archives here. Do you want to post your manuscript on your personal or institutional website? Go ahead. Elsevier encourages you to showcase your research. If your funder or employer requires you to post your articles, Elsevier needs an agreement in advance to make sure that the organisation's manuscript posting policies do not undermine the quality and sustainability of the journal. Typically, such an agreement entails a period of embargo, as well as links to the published journal article. For example: Elsevier has an arrangement with NIH under which Elsevier deposits accepted author manuscripts to PubMed Central for authors reporting research funded by the NIH. As a result, Elsevier has deposited more than 80,000 author manuscripts since 2005. For further details, please visit our posting policy page. For more information on how you can use articles published with us, please download this informational pamphlet. If you would like to know more, visit our website or contact universalaccess@elsevier.com. Alicia Wise holds a PhD in Anthropology from the University of North Carolina - Chapel Hill. She joined Elsevier in June 2010 as Director of the Universal Access team. In this role she is responsible for our access strategy and policies, for launching/monitoring access pilot projects, and for building relationships with other stakeholders in the scholarly communication landscape who share our interest in broadening access. The universal access team works closely with colleagues throughout Elsevier and is a catalyst for information exchange and innovation.